File Event Listeners allow you to monitor changes on a specific local file system path or remote URL – for example, new files appearing in a folder – and react to such an event with a predefined task. 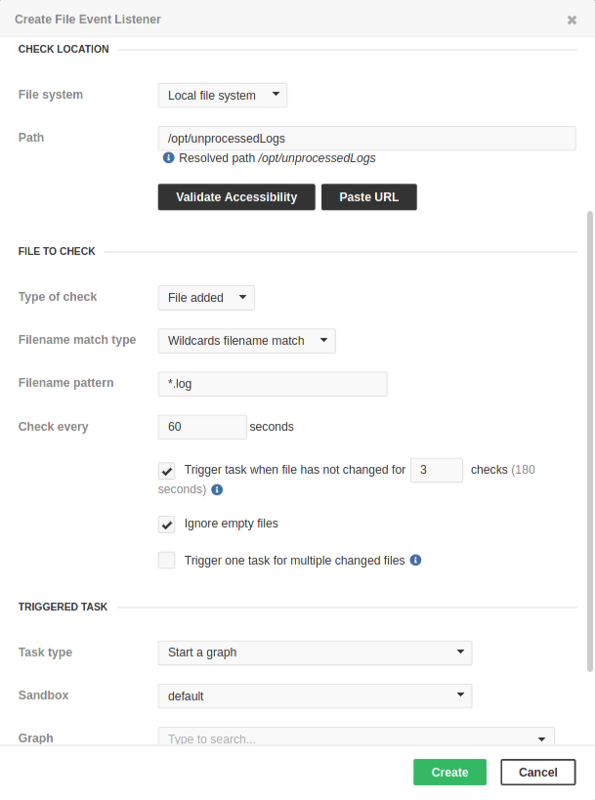 You can either specify an exact file name or use a wildcard or regexp, then set a checking interval in seconds and define a task to process the event. There is a global minimum check interval that you can change if necessary in the configuration (the clover.event.fileCheckMinInterval property). See Chapter 15, List of Configuration Properties. EVENT_USERNAME The name of the user who caused the event. EVENT_USER_ID A numeric ID of the user who caused the event. The name of the file (without the path or URL) that triggered the event. Present only when Trigger one task for multiple changed files is disabled. A resolved (without placeholders) path to the observed directory on the local filesystem. Valid only for a local file listener. The type of the file event. Possible values: SIZE, CHANGE_TIME, APPEARANCE, DISAPPEARANCE. EVENT_FILE_LISTENER_ID An ID of the listener which triggered the event. Full URLs to access the files, e.g. in the File URL attribute of components. If Trigger one task for multiple changed files is enabled and there are multiple URLs, they are separated by a separator specified by CloverDX Engine property DEFAULT_PATH_SEPARATOR_REGEX. EVENT_FILE_AUTH_USERNAME A username/ID to the remote location. EVENT_FILE_AUTH_USERNAME_URL_ENCODED The same as EVENT_FILE_AUTH_USERNAME, but the value is also URL encoded, so it may be used in a URL. EVENT_FILE_AUTH_PASSWORD A password/key to the remote location. It is encrypted by the master password. EVENT_FILE_AUTH_PASSWORD_URL_ENCODED The same as EVENT_FILE_AUTH_PASSWORD, but the value is also URL encoded, so it may be used in a URL.